Maison de luxe avec piscine et quai en eau profonde, à quelques minutes de St Michaels. Luxueux domaine à cinq minutes de St. Le Michaels comprend un télescope traditionnel de la côte est avec salon et salle à manger, une salle familiale et une grande cuisine avec planchers de tuiles italiennes et tous les appareils en acier inoxydable Kitchen Aid. La maison est confortablement meublée avec des antiquités anglaises et asiatiques. Un jardin végétal biologique, une piscine et un patio au bord de l’eau donnent sur la crique profonde qui offre une vue tranquille sur l’eau et une variété de sauvagine été comme hiver. Il y a une chambre au premier étage avec salle de bains avec une accessibilité réduite pour les handicapés (fauteuils roulants jusqu'à 22,5 pouces). My husband surprised me with a "get away" week to St Michael's in July; when he showed me the photos online I began to count down the days. We arrived with my 81 year old mother, niece, step son, girlfriend, and dog in tow and immediately fell in love with the place. So much so, we booked again end Aug-Sept for two weeks. The home/property really is an extension of the lovely owner -- warm, elegant, natural, and clearly, an incredible host. We immediately felt a sense of home (with a better view!). On our first visit we were greeted with two lovely welcome baskets: one for 'humans' (filled with goodies from local vendors) and another for our dog, Scout. The second stay included Kitty treats for the other four legged member of our family. My husband and I were pretty specific in what we wanted in a home away from home: privacy, updated but not overdone, elegance with Eastern shore feel, pet friendly, clean, dock, spacious with unobstructed water views, close to town (under 3 miles) and enough yard for the dog to roam. We were delighted with the fresh Vegetable garden with delicious tomatoes, cucumbers, lettuce, etc and now add that to our "must have" list should we look outside of St Michael's. 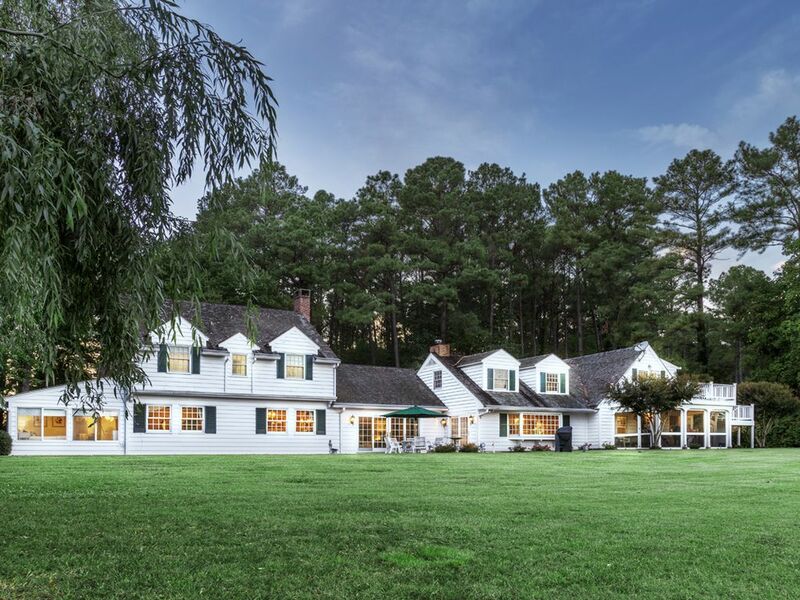 As for vacationing on the Eastern Shore, we are set -- we found our Home Away from Home in this exquisite property and we are already lining up for our next stay. We travel a lot and are fussy, and we have rented in St. Michael's before. This house was wonderful---meticulously maintained, decorated with great taste, well-equipped kitchen, all needs and wants anticipated. The setting is spectacular---glorious water, many places to sit and watch the birdlife, perfect pool, lovely screen porch for dining late into the night. We hated to leave. Our goal is to present a comfortable spotlessly clean home that is well stocked so guests can enjoy this beautiful property to its fullest, thank you so much for your kind words. We rented this lovely home for 2 weeks over the 4th of July weekend. Upon entering there is a long beautiful driveway and you find yourself exhaling. The house is spacious , very clean and well stocked. The 4 bedrooms were lovely and spacious. For a 4 day period there were 8 of us occupying the house. We did some cooking at the house and found the kitchen to be well Equipped. There is a well maintained garden and the owner encouraged usage which I took full advantage of. The house gets lots sun in the late morning / early afternoon so the pool was a welcome addition. There is an additional shower off the screened in porch that came in handy! The yard is super spacious and also well maintained. The owner is so gracious and provided handbooks for any and everything one might need to know. Her restaurant recommendations are spot on. There are local supermarkets, seafood markets, local produce, restaurants and golfing just minutes away. By 5:30pm head down to the dock and enjoy the peace and quite of the evening. There is rarely traffic on the water and its still. So if you're into paddle boarding or kayaking its perfect! Lots of beautiful birds and butterflies are on the property. We did spend the evenings out on the patio by the pool so there are mosquitos. I remedied that problem with citronelle candles. occasions. It is exactly as descibed and more. We live in DC and traveling back and forth a couple times took about 1hr 20min! Thank you so much for your lovely review of "Content", our goal is to make sure that our guests have a relaxing and worry free vacation here on the beautiful Chesapeake Bay. We endeavor to provide everything that one might need to enjoy the experience, thank you and we hope to see you again. Domaine de luxe situé à 10 minutes de St. Michaels où abondent les restaurants raffinés, les expositions d'art, les antiquaires, les musées, les marchés de producteurs, la voile, la pêche et les sports nautiques. Le cyclisme et l'observation des oiseaux sont des passe-temps favoris. Détendez-vous et profitez d'une escapade vraiment unique sur la côte est.